January is a depressing month, even more so when it’s at the beginning of a recession. This city and it’s people need something to smile about again and we need you to help make it happen. Free Art Friday is a relatively new art movement that’s rapidly gaining in popularity around the World. Artists create a painting, sketch, sculpture or installation and leave it on the street. The piece can then be picked up by anyone and claim it as their own. Finders are encouraged to email the artist and tell them how and where they found it. We’re asking all painters, photographers, illustrators, sculptures, graffiti artists, taggers, cartoonists or any visual artist to contribute a small piece of work that will be hung/placed/or left on the streets of Dublin on Friday 23rd January for anyone to take away. 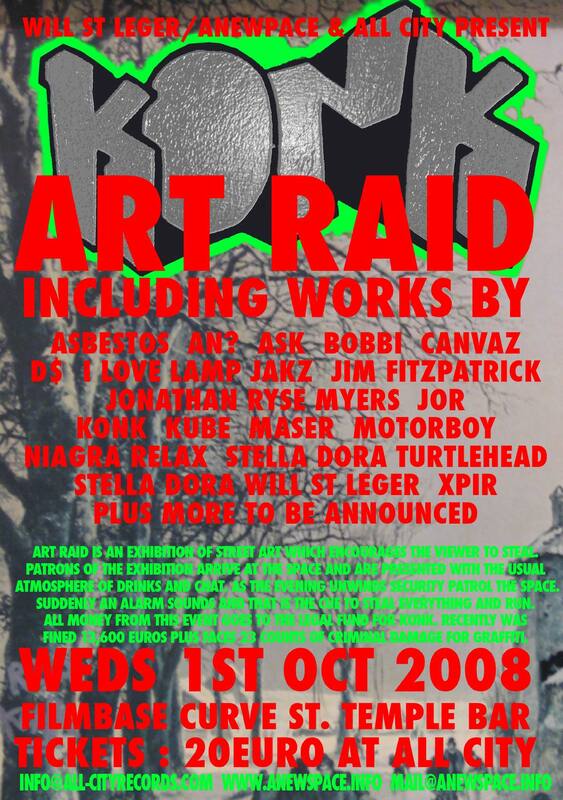 If you missed ‘Art Raid’ during the Dublin Fringe Festival in 2007, I’m bring it back for one night only. But this time it’s to raise money for a young graffiti artist called Konk that has been fined €13,500 by the courts. The artist is back in High court on 20th Oct and may face jail. Tickets are available from All City Records on Crow Street, Temple Bar. €20 will give you a chance to get your hands on some of the best work by International and Dublin street artists like Asbestos, Maser, D$, xpir, Motorboy, Turtlehead, I Love Lamp, Loki, An?, Jim Fitzpatrick, Canvaz, Will St Leger, Konk, Jor. Even celebrities like Jonthan Rhys Meyers are giving work for free.